For a very long time, the standard filling material has been a silver-mercury amalgam. This is a reasonable restoration used by many practices today, but Dr. Leach is proud to only use white bonded fillings that are strong, bond to the tooth more securely than metal, and look beautiful. 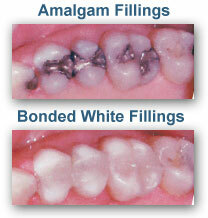 Of course, many patients would choose the white bonded filling simply because of appearance. They are a natural-looking white that blends with the tooth and is virtually unnoticeable. But they have other advantages, as well. Metal does not adhere well to teeth, so decay can and does seep back into the tooth. Our fillings bond tightly with the healthy part of your tooth, so there is much less possibility for decay in the future. For other patients, the best feature of these fillings is that they are mercury-free. Metals expand and contract, which can cause damage to the tooth or at the very least shorten the life of the filling. Using no metal at all in your new fillings means there’s no concern about metal sensitivity or waste. Have questions about our metal-free fillings? Call (423) 586-3432 and our team will be happy to help!